Chernobyl Has a Future – but Which One? When Victor Zalizetskyi met a small group of foreign journalists only about three hundred meters away from the disastrous Reactor 4 of the Chernobyl NPP, the first thing he said was “please come closer”. Finally we ended up about 250 metres away from the reactor which caused – exactly 30 years ago - the world’s worst nuclear accident. The Deputy Project Manager for Construction said proudly, “look at the workers around us, regarding their work outfits, do they look special?” No, they did not and Mr Zalizetskyi explained, “last week we lifted all special clothing and working hour regulations for this area”. It was impressive; we were standing only a little more than 200 metres away from the core of the accident, where about 20% of the reactor are still inaccessible because of extremely high radiation and other unknown conditions. The people here are working on another “first and biggest in the world” under the same conditions as their colleagues on any other construction site in the world. Chernobyl is a place of extremes. First, it was the place of the world’s worst nuclear disaster; now, it is the site of the construction of the New Safe Confinement (NSC), according to the European Bank of Reconstruction and Development (EBRD) “a design and construction project unprecedented in the history of engineering”. Immediately after the explosion of Reactor 4 on April 26 1986, as a matter of emergency a protection shelter had to be built around the collapsed construction. The concrete shelter, known as the Sarcophagus, was given a live expectancy of 25 years which could be stretched to another 10 years. There was no doubt that now one had to find a successor, which is called New Safe Confinement or “the Arch”. After years of ground preparations, the area has been covered with a concrete slab to minimise radiation exposure. The work on site started in late 2010 and was scheduled to be completed in late 2017. However, Mr Zalizetskyi points out, “we are ahead of schedule”. The French consortium Novarka, formed by the construction groups Vinci SA and Bouygues SA, got the contract in 2007. Both from the material supply side and the work force, it is however a global project. Companies from Turkey to the US are contributing to the enormous structure and around 1200 people from 20 countries are working on the site. The stainless steel frame, supported by two longitudinal concrete beams, has a height of 110 metres, is 165 metres long and has a span of 260 metres. It could easily house Paris’s Notre Dame Cathedral – or New York’s Statue of Liberty. The NSC construction was built in two halves which were recently joined. In a few months’ time, the giant arch, which weighs about 36,000 tons, will be pulled and pushed with a speed of 12 metres per hour in the direction of the sarcophagus. According to the EBRD, “the largest moveable, land-based structure ever built” will be slid over the damaged reactor including the sarcophagus. The main purpose of the new arch is to prevent the release of contaminated material from the present shelter and at the same time protect the structure from external impacts such as extreme weather. It will be strong enough to withstand a tornado with a speed of up to 320 km/h and its sophisticated ventilation system will minimise the risk of corrosion in the structure’s lifetime of 100 years. The arch is equipped with strong robotic cranes inside which will be able to dismantle the collapsed reactor in the future. 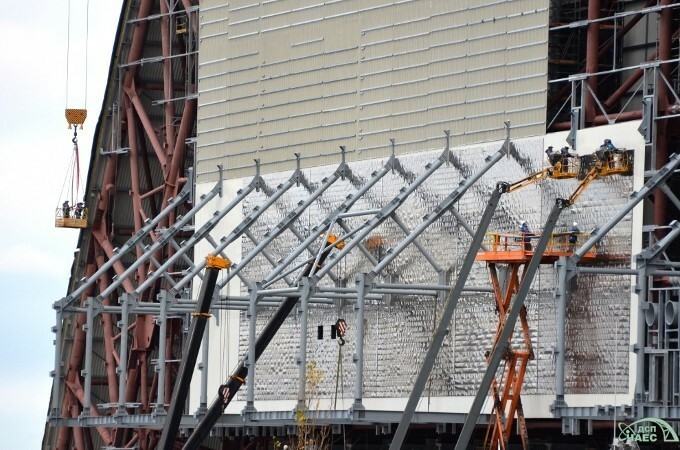 Even though the New Safe Confinement is catching most of the interest because of its enormous size, there are other projects going on which also make very important contributions to the confinement of radiation and the handling of radioactive material. After the Reactor 4 accident, the other three units stayed in production for several years after. First, in October 1991, unit 2 was taken off the grid, followed, in November 1996 by unit 1 and in December 2000 by unit 3, a neighbour of the disaster reactor. The EBRD states, “as with most nuclear plants in the former Soviet Union, there were serious shortcomings in the technical and financial provisions for the decommissioning process.” First to be built and by now completed and in the test phase is the Liquid Radioactive Waste Treatment Plant (LRTP). It retrieves highly active liquids from their current tanks, processes them into a solid state and moves them to containers for long-term storage. For different reasons, another ongoing project is more complex: the construction of the Interim Spent Fuel Storage Facility (ISF2). After the original contractor, the French company Areva, withdrew in 2007, the US-company Holtec took over and started construction in 2010. According to the company, the project is nearing completion and will break some engineering records. It is, reportedly, the world’s largest facility of its kind and the world’s largest “hot cell” for dismembering the conjugated RBMK (Chernobyl reactor type) fuel assembly. 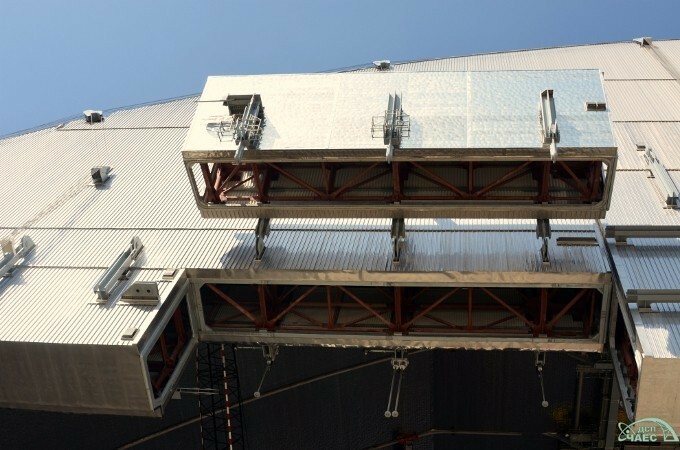 ISF2 will store the Double Wall Canisters filled with used fuel assemblies from the three shuttered reactors for approximately 100 years. Test runs are already going on, and the facility is scheduled to be completed next year. Then Ukraine’s reliance on Russia to store their spent nuclear fuel will come to an end and will make the country completely operationally independent in regards to managing and storing their spent fuel discharged by their reactors. Furthermore, over the years, Ukraine will save the rapidly escalated fees it has to pay Russia for the storage. Today, in the area of the Chernobyl Nuclear Power Plant 1,069 cubic metres of low radioactive material are accumulated, 926 cubic metres of medium and 506 cubic metres of highly radioactive material. In the entire decommissioning process, the EBRD plays a crucial key role. Whilst some projects had been financially based on bilateral agreements, the most important and most expensive ones have the London based European institution not only as a fund manager but also as a major contributor. EBRD € 498 million, European Commission € 431.6 million, United States € 329.5 million, France € 114.9 million, Germany € 106.1 million, United Kingdom € 89.5 million, Japan € 83.8 million, Italy € 74.2 million, Russia € 70.3 million and Ukraine € 64.1 million. For Ukraine, Chernobyl is only one of the many burdens the country has to shoulder, but it is a special one. According to the national budget for 2016, the government is paying 1.9 billion Ukrainian hryvnia, UAH (€ 66 million) to the State Agency of Ukraine on Exclusion Zone Management. Out of this amount 998 million UAH (€ 34,7 million) are earmarked for the security in the Zone. The Zone covers 268,000 ha and is divided in the 30 km and the 10 km Zone which comprises the NPP. The visiting regulations are strict. An “Instruction Bulletin” says that visitors should “use clothes and shoes covering body, head, arms and legs at the maximum” and it is prohibited “to touch any objects or plants, walks, be seated or put personal items, including photo and video cameras on the ground”. A return to a normal political and diplomatic relationship between Ukraine and Russia would make life easier even for “Chernobyl”. Even though there are no indications that Russia has broken any contracts, Ukraine is still being supplied by Russia with reactor fuel and most of the Ukrainian nuclear waste is stored in Russia, there are no contacts on governmental level. Igor Gramotkin, CEO of the State Specialised Enterprise Chernobyl Nuclear Power Plant (SSE-ChNPP), tells EER that in the decommissioning process he tries to keep politics out. The fact that the Russian state-owned company Rosatom right now is without any major contracts, is just coincidence and Mr Gramotkin points at the EBRD which is in charge of contract decisions. In an interview with the Ukrainian newspaper Zerkalo Nedeli, Mr Gramotkin says, “Russia and Ukraine are going through difficult times, but we must go back to a normal relationship”. Ukrainian President Petro Poroshenko on the other hand said the Chernobyl disaster had been Ukraine’s biggest challenge between the Nazi occupation in World War Two and the recent conflict in eastern Ukraine, which he described as “Russian aggression”. When the current major NPP projects are finalised, Ukraine is supposed to take over upcoming decommissioning work. That, at least, is the plan. Whether Ukraine is able to do that, including financing, has to be seen. According to Mr Gramotkin there is, at least, no workforce shortage. On the contrary, the workers are afraid of losing their jobs. Chernobyl is, so it seems, an attractive workplace. One thing, however, is for sure, Ukraine will not give up on nuclear power. The country is heavily dependent on its 15 NPPs. The President stressed recently the political importance of nuclear power for Ukraine, saying the country would “neither today, nor tomorrow” halt nuclear reactors because of the importance of maintaining the country’s energy independence. In the area of Chernobyl NPP two unfinished cooling towers are testimony to the immediate stop after April 26 1986 of the construction of two new plants. However, even today two NPPs are under construction. Perhaps the future of the Exclusion Zone lies in nuclear power. There are early plans to use the experience from Chernobyl NPP for the development of a decommissioning and storage facility for Ukrainian nuclear waste. Hanna Vronska, Ukraine’s acting Minister of Ecology and Natural Resources, said the government was considering the creation of a biosphere to preserve the unique ecosystem for further study. “Wildlife has flourished in the forest, which is largely off limits to humans”. According to Ms Vronska, “it will be possible to do scientific research in the area”. Another industry is already in place and strongly increasing: tourism. Last year more than 10,000 visitors entered the Zone and the tour operators are optimistic. When we left the Zone after a dozen passport controls and half a dozen radiation checks, we were told that during our visit we had been exposed to a radioactivity dose similar to that one receives during one hour of flight. 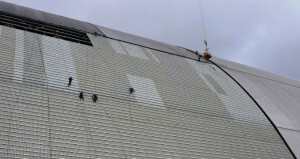 All images New Safe Confinement Construction. Source: The State Agency of Ukraine for the Exclusion Zone.